Sure Champ customer Paige Van Dyke of Illinois wins Grand Champion Junior Show Red Angus Female at the 2016 National Western Stock Show. BioZyme Inc. brand Sure Champ® was selected “Best Cattle Feed Supplement” in the 2015 Best of the Barns awards program. One of the most prestigious annual awards recognizing leading businesses and individuals in the livestock and agriculture industries nationwide, the winners are selected based on popular vote by fellow industry professionals. Sure Champ has won the award a total of four times. Sure Champ is a top-dress supplement that promotes a healthy appetite daily and during high stress times, strengthens growth rate and muscle development, improves digestibility of feed, and enhances eye appeal by promoting freshness and increased hair and skin quality. 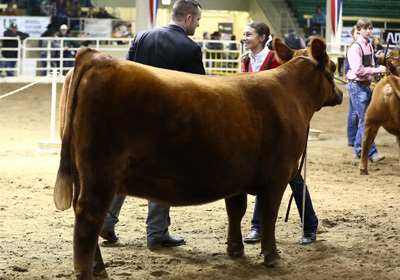 Sure Champ is used and recommended by livestock show champions across the country. This year, a record 45,450 online votes were cast to select the winners in more than 50 different categories. The awards are sponsored by Sullivan Supply.